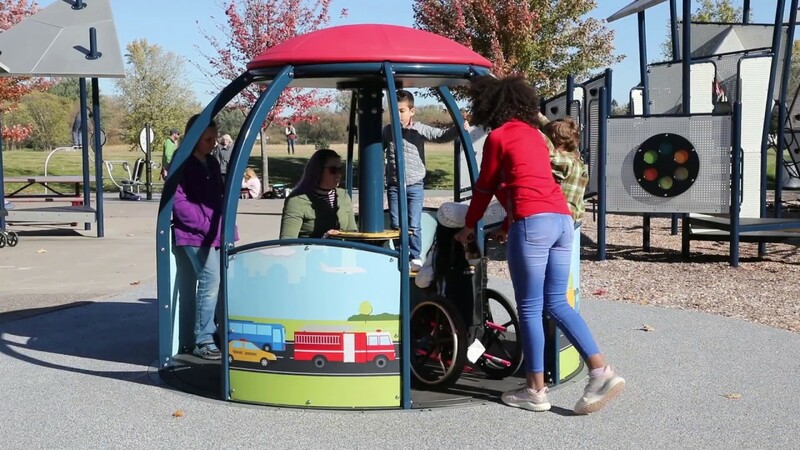 This next-generation merry-go-round offers plenty of space for more kids of all abilities. Strategic seating areas leave ample room for wheelchairs, including those without a wheel-locking mechanism. Once aboard, everyone faces the center so they can easily share smiles, laughter and conversation while in orbit. REACH EXCITING NEW HEIGHTS IN PLAY! This exciting net climbing structure adds visual appeal to any playground and accommodates lots of kids all at once, offering a plethora of opportunities to climb, crawl and hang out. RELAX OR SPIN ON THE CHILL™ SPINNER! Take a spin on the Chill™ Spinner or just relax in its comfortable seat. The textured rubber belting creates a comfortable and secure ride for all kids to enjoy! The spinning motion offers vestibular stimulation and helps kids understand centrifugal force and cause-and-effect. These large chimes provide the lowest, most resonant notes of the Rhapsody® collection. Eight Vibra™chimes, each with their own mallet, play eight different notes to make up a major diatonic scale. An excellent addition to playgrounds, parks, schools, museums and more. Other new Rhapsody instruments added to the existing collection include the new Cascata Bells and Tongue Drum. FUN SPINNING FOR ONE OR MULTIPLE KIDS! The Curva™ Spinner is a beautiful and fun addition to any play space with endless colour choices. It offers vestibular stimulation and promotes experimentation with centrifugal force and cause-and-effect. Winner of the "2017 Excellence Award"
Whether you are looking for inclusive, nature-inspired, fitness-focused, themed playgrounds or independent pieces like swings, slides, bobble riders or climbers, we have a design that is right for you. Poligon Park Architecture offers steel framed sun shelters, gazebos, shade structures, pergolas, trellises and carousel houses with over 100 original designs and unlimited custom design options. Dumor offers a full standard line of benches, tables, receptacles, and accessories. DuMor also offers custom designs and fabrications to suit any need. Choose from a variety of options including poured-in-place rubber, rubber mulch, engineered wood fiber, artificial turf and others. Aquatix offers splash pad equipment to meet any size project. Designs include Classic Structures, Artistic Structures, Themed Structures, Ground Sprays, Multi-play Structures, Slides and Tot Structures.